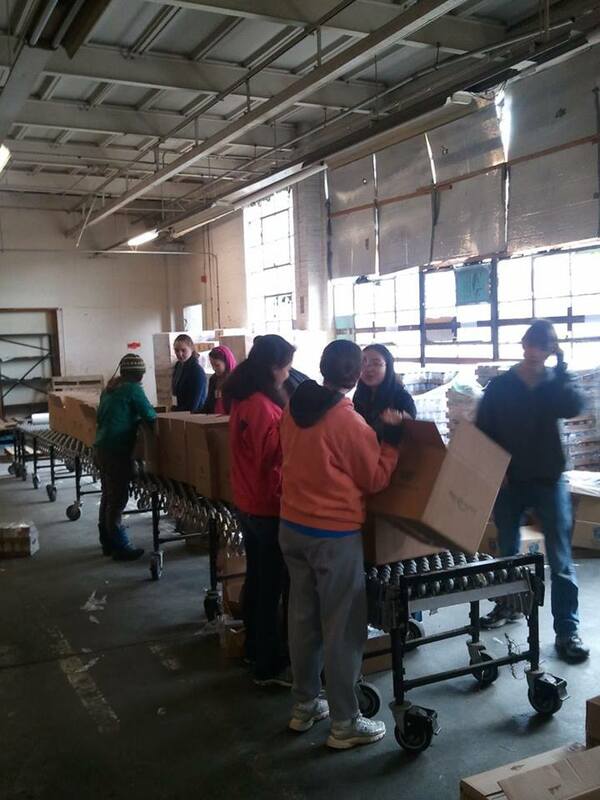 Our morning began with volunteer work at SHARE in the East Falls neighborhood of Philly. The SHARE Food Program is a nonprofit organization serving a regional network of community organizations engaged in food distribution, education, and advocacy. SHARE promotes healthy living by providing affordable wholesome food to those willing to contribute through volunteerism. The focus of the service-learning this week is food security. We will be working with various organizations that seek to help provide enough nutrition to people of all ages in the Greater Philadelphia region and beyond. 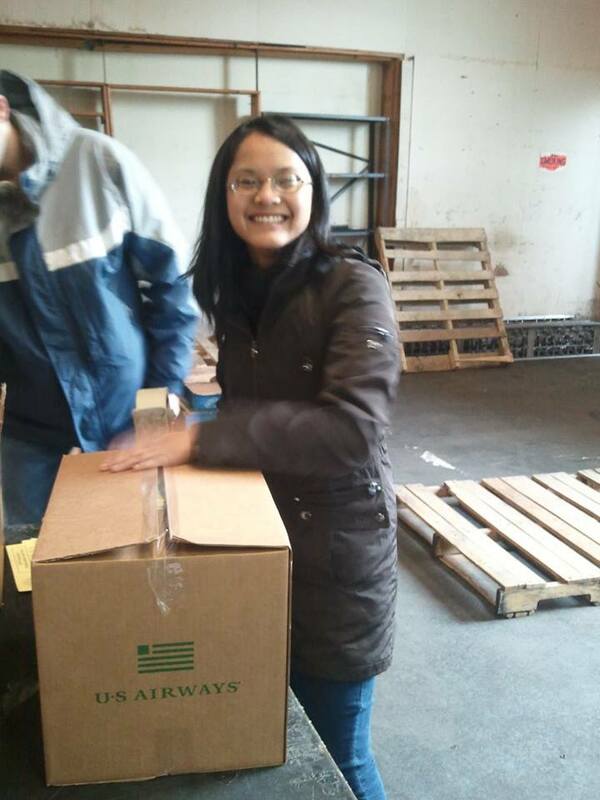 Organizations like SHARE rely on volunteers and donations to help pack boxes and organize the tons of food that arrive at their warehouse so they may distribute the food to the thousands of food pantries, shelters, and soup kitchens in the region. Sadly, malnutrition and food deserts are a serious problem in Philadelphia. Many, many people especially do not have access to fresh fruits and vegetables. And so we worked in the warehouse–doing whatever was needed. We were also fortunate to meet up with another group of college students from the University of Georgia. And there were plenty of smiles to go around. We headed back to Haverford College for a workshop with Rachel Aistrop, an Americorps VISTA who works as the Immigrant Outreach Coordinator at the Coalition. The Philadelphia Coalition Against Hunger strives to build a community where all people have the food they need to lead healthy lives. The Coalition connects people with food assistance programs and nutrition education; provides resources to a network of food pantries; and educates the public and policymakers about responsible solutions that prevent people from going hungry. Rachel led us in an interactive workshop about hunger issues. We learned about the startling facts related to the millions of people who do not have access to nutritious foods. We discussed the numerous health, psychological, educational, and community problems that arise because of hunger. Then, we split up into small groups and participated in a role play. We were each tasked with creating a budget for families on the SNAP program. Based on actual experiences of families, these case studies proved to be difficult for us to work through. In the end, it was nearly impossible to find a way to pay for food, health care, transportation, etc….even with SNAP! Rachel challenged us afterwards to be more aware of policies related to food stamps, hunger, farming, and social programs. We look forward to workshop #2 on Wednesday. We traveled to Chestnut Hill to the home of a member of the Friends Society. We sat down in a circle in the living room and got comfortable. Then, Susan Lee Barton, Conference Associate for the Friends General Council Conference, led us in a time of silence. Many Friends meetings follow the tradition of gathering in silence. Anyone may speak or sing or read something if he/she is so moved. In our case, only one person felt moved to share. The rest of the group sat in silence–most with closed eyes–for about thirty minutes. This time of silence ended as we held hands in the circle. Afterwards, we shared a little bit about ourselves. Then, we shared a potluck meal and had the opportunity to reflect on our experiences.